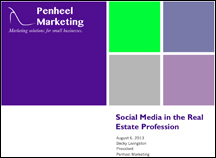 On August 6, 2013, I presented a social media primer to the Coldwell Banker Real Estate group of Ramsey. In that session I shared the following resources, including how real estate agents are using Twitter, Pinterest, Facebook, LinkedIn, and various video platforms to promote their properties. Additionally, social media stats in the real estate profession were included, along with tips on how to get started with social media for your business. Please contact me if you have any questions about this content or if you’d like to discuss how social media may be leveraged in your marketing efforts. Visit our Services page to learn more about what we do. Then our Client page for the various clients we work with across the country. Also, connect with us on Facebook, Twitter, G+, LinkedIn, and Pinterest. If you are interested in learning more about how social media can influence your brand’s reach and impact, or are just looking for some help on social media overall, contact me.